Welcome Home! !t MOVE-IN READY home is ready now for new homeowner. 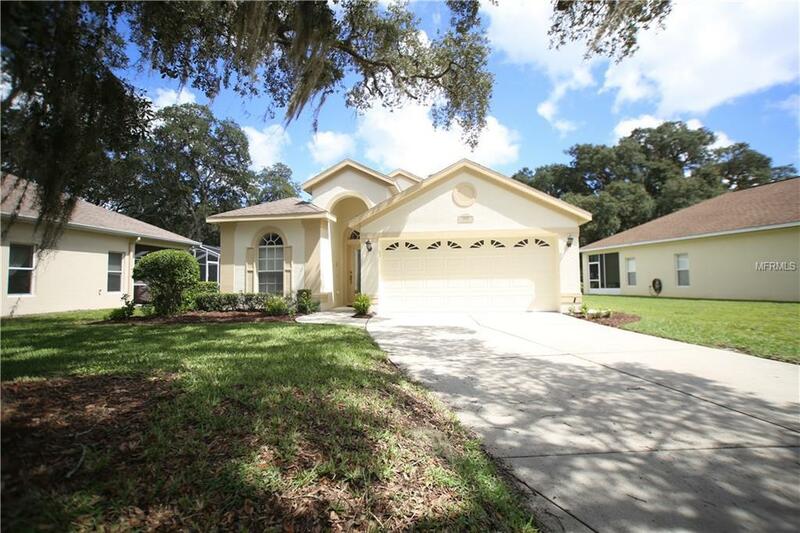 Spacious 2 bedroom PLUS DEN, 2 bath, 2 car garage home sitting on lovely cul-de-sac lot and surrounded by stately oaks. Recent updates 8/2018 - Exterior of home has been freshly painted, NEW laminate floors thru-out, New tile in master bath and second bath plus laundry room. Beautiful open floor plan featuring living/dining area, family room, breakfast nook and a huge extended covered, screened lanai - perfect for entertaining. No rear neighbors offers a relaxing serene setting. Large master bedroom and master bath. Dual sinks, garden tub and large walk-in shower. Their is a very large walk-in closet. NO CDD fees, No Flood insurance. No lawn-mower as lawn care is maintained by the association. Trash removal is also taken care of. Don't delay - this home is ready now for you. Amenities Additional Fees $150.00 Hoa Fees Cover Common Area Gates Roads Street Lighting Lawn Care Sprinkler Repair Trash Removal Hoa Managment Services.